Choosing your Feather centerpieces for your wedding can be a daunting task but hopefully this will help. Color: Choosing the right color for your feathers is actually the simple part. For most weddings the color of choice is white. 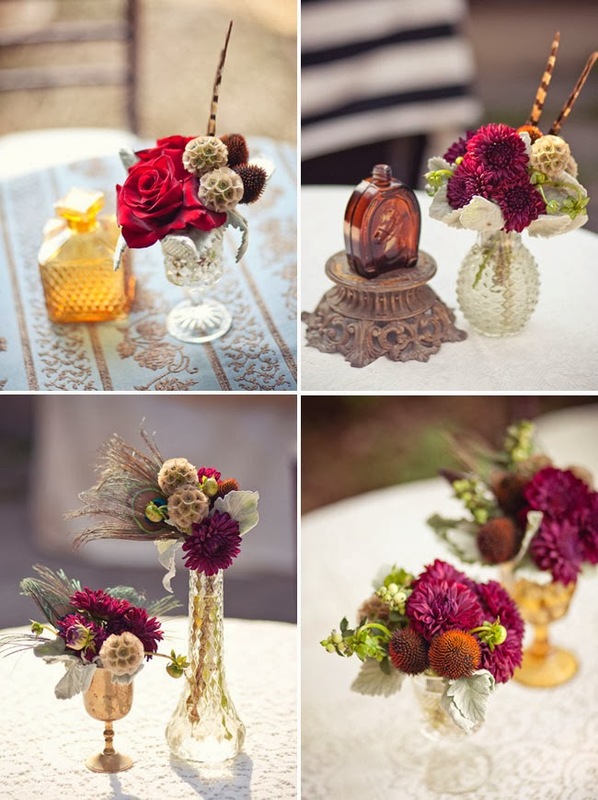 You can add a touch of color in your centerpieces but don't go overboard. 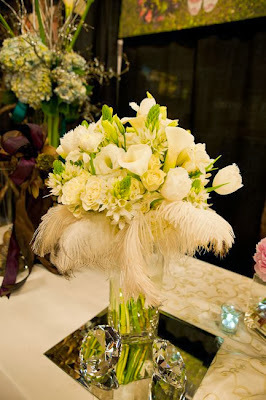 Some brides ask for an Ivory colored feather but they end up just looking like a dirty version of the all white plume. 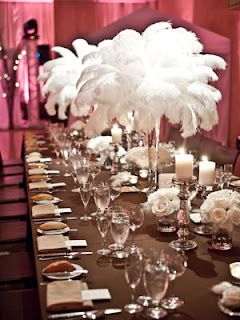 Type of feather: There are 3 types of feathers that people use in their centerpieces, spads, drabs, and plumes. Spads are the worst kind of feather you can use. They have no droop to them and they look like sticks with hair on it. Drabs are a little better they have a little more droop to them and they tend to be on the smaller side. Plumes are the feather of choice and if it is anything less than 22" it wont have the same effect. Any Feather centerpieces professional will use 22"-30" male ostrich plume in their centerpieces to give you the desired effect. If they don't have them to show you before your event DON'T use them. Fullness: If you are using a 4" Styrofoam top the minimum number of feathers that should be used is 50. Anything less than 50 will have holes in them and wont look as rich and fabulous. If you are using a jumbo 12" Styrofoam top the absolute minimum number of feathers used should be a 100 feathers. 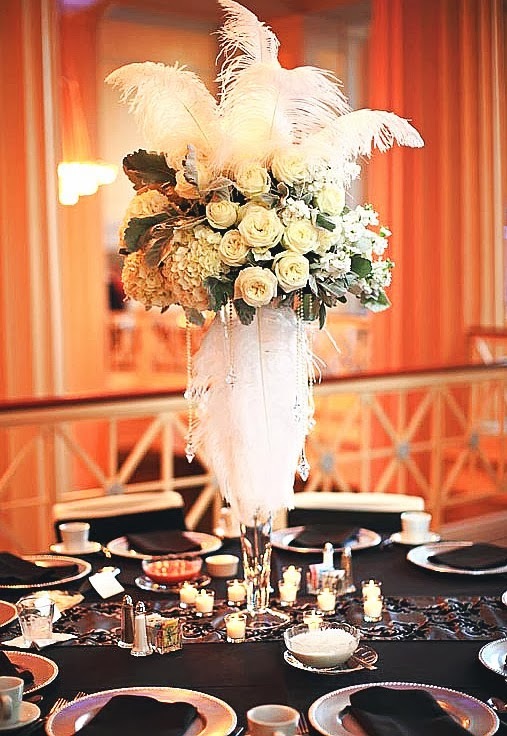 A lot of customers do not realize that their centerpieces are really skinny and sparse and they need double or triple the amount of feathers they already have. Crystal: You can have your centerpiece with no crystal but for your wedding the more bling the better. You can get the basic dangling crystal but is you want to get some real pop you have to get the MEGA crystal there are over 200 crystals in these centerpieces and can make the difference between having a great wedding and a platinum wedding. Also if you are getting a clear vase it would be recommended to use water crystals in your vase filled a minimum of 3/4 of the way to the top. 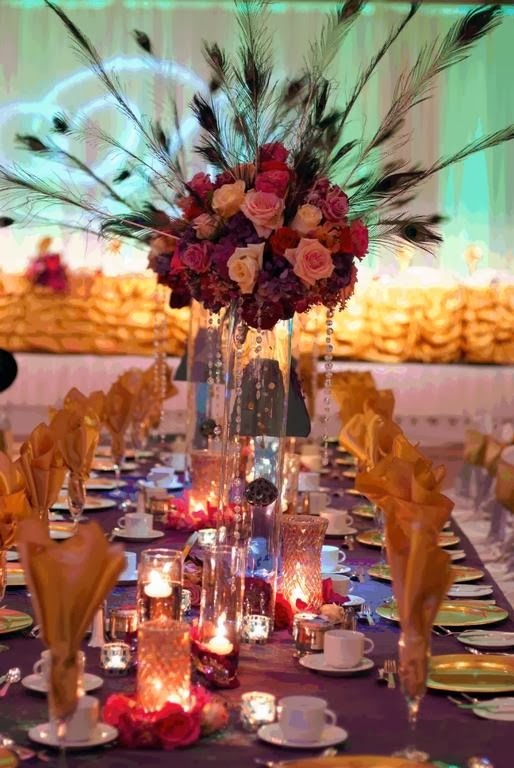 Lighting: Centerpieces can be done with or without lighting but if you are getting something so beautiful you will want to make sure that your guest can see these beautiful work of art. The options are between submersibles and lighted bases. Submersibles have the least amount of brightness and should only be used in small centerpieces like the Eiffel tower vase. 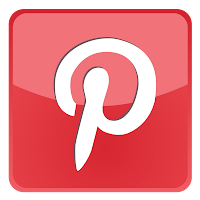 If you are using a 32" clear vase or a spandex centerpiece a lighted base is a must!. It really will bring the most out of your vase giving your centerpieces the necessary attention they deserve. You can also get really creative with your lighting option by making them change different colors it will help give your wedding a little more creativity.